U-Cut shafts can be shortened up to 6 inches and require a grip with an approximately 7/8” mounting hole. 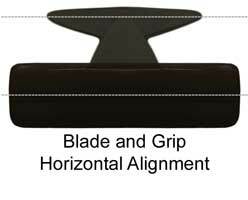 Determine your ideal paddle length (click here for Paddle Sizing Guidelines) and deduct your grip height. (Note: Do not include shaft insert length). Cut paddle to length determined above. Remove the rough edge of the cut by lightly sanding with sandpaper. Ensure the grip fits the shaft with a trial fit. For your safety, put on gloves before handling epoxy. Mix epoxy according to manufacturers instructions and thicken to the consistency of cake frosting. Trowel epoxy into the grip hole, ensure that it is applied on all sides. Put grip on the shaft, ensuring that the shaft is inserted completely. Remove excess epoxy from around the shaft and grip connection. Allow epoxy to set undisturbed per manufacturers directions. Please feel free to call Sawyer Paddles & Oars at 541-535-3606 or email us with any questions or concerns.